Deep learning is fueling what many believe will be the biggest technology revolution the world has seen. 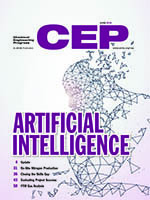 Chemical engineers routinely use computers for modeling, simulation, design, and optimization of chemical processes. Could computers do more than mere computation and someday solve high-level problems like a chemical engineer? Other topics in this issue include on-site nitrogen production; closing the skills gap; evaluating project success; and FTIR Gas Analysis.